As our lives become more digital and we share more with the world, our Cyber Security is becoming of the utmost importance. Whether it’s protecting your bank accounts, your identity or your children, we have to all start taking our cybersecurity seriously. 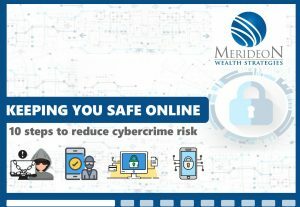 As part of Merideon’s focus on protecting our clients’ wealth, we have been constantly working on our own cybersecurity, but now are excited to launch our client CyberSecure plan. By educating our clients and ensuring you are more secure, we will reduce the risk of your finances (and other parts of your life) being attacked by criminals. We encourage you to download our CyberSecure Guide and work through the suggestions. However, we implore you to use this as a starting point and continue to educate yourself and stay up to date on this growing risk. Download our free CyberSecure Guide today and complete the checklist as soon as you can.